I was a little nervous about my practice run of looking slowly at a single piece of art. I have never been able to focus on an artwork for more than 2 minutes without fidgeting and I can’t even spend time sitting in a room full of friends without doodling or making crafts to occupy my hands and wandering mind. Standing still for ten minutes absorbed in a single work of art seemed very daunting. However, armed with the task of my Slow Art Day homework assignment and my choice of El Anatsui’s undulating sculpture Black River, I had no problem spending fifteen minutes admiring the textile constructed out of recycled metal. I had noticed the piece before working with Slow Art Day but I had never taken the time to see how many different types of recycled caps were used, how the light filtered through the negative space between the pieces of metal and how the curators had strategically pinned the sculpture against the wall so that it appeared like a cascade of gold. I admired it from numerous angles and different distances for its texture, and after reading the museum plaque, for its meaning. And the experience didn’t just change how I saw that artwork. After leaving the museum I was able to focus more than I had ever before. I generally appreciate the beautiful and interesting aspects of my environment as an artist and an art history major, but I rarely take the time to actually stop and stare at something I find intriguing. After my slow encounter with Black River, I noticed a gaggle of geese and stopped to stare at them for over ten minutes. I took in the texture of their webbed feet, noting how it compared nicely with their fluffy feathers, and gawked at the striking contrast between their black necks and the white patches underneath their eyes. Slow Art Day has taught me that art is everywhere and anything can be beautiful as long as you take long enough to sit and appreciate it. What a great experience, Gabrielle. And thank you for sharing it. 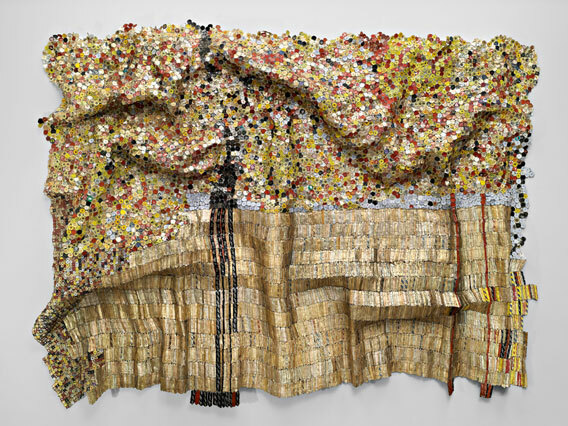 I could drown in one of El Anatsui’s cascades. I discovered him in New Orleans at Prospect 1 a few years ago and think he’a a genius. Speaking as someone who has only glanced at this piece when I went to the mfa for a little bit, I’m amazed at how you picked up on such beautiful nuances that I missed when just looking at it as a whole. Now I want to go back and look at it more closely!